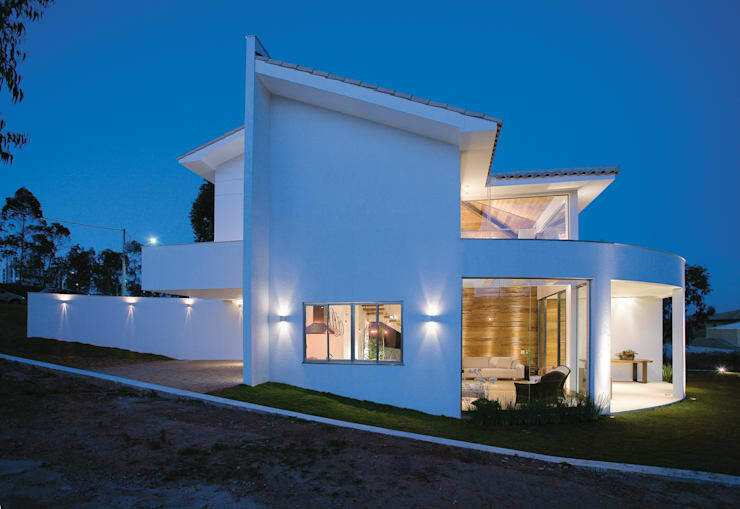 Today on homify we are taking a trip to the colourful and lively Latin American country of Brazil! As the largest country within South America and the fifth-largest in the world, there is a wide-ranging collection of some of the most interesting architectural concepts and designs. The house we will be visiting today has been designed by Isabela Canaan at Arquitetos e Associados, and is a truly spectacular and original dwelling. Nestled within the Brazilian countryside, the house is evocative of the natural landscape it rests upon. Geometric and elegant in its appearance, the interior presents a loft-like aesthetic and design. To ensure an environmental cohesion, the structure has been built using timber, and neutral, somewhat muted and earthy tones. Texture is a characterful addition, epitomising the effortlessness of the surrounding scenery and terrain. Inside the dwelling, an openness and spacious quality is evident. Contemporary, with a hint of rustic ambience, the house is well-equipped to offer a 21st century experience. If you would like to take a tour inside this intriguing and unique home, check out the images below, and seize a little inspiration to start planning your next countryside escape! 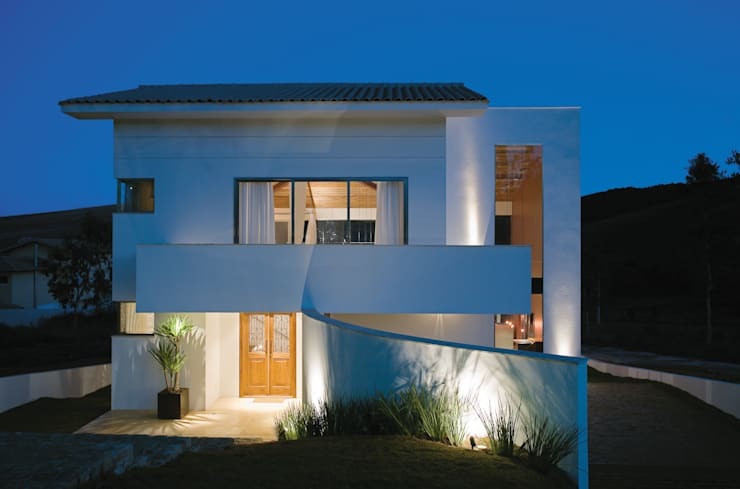 Viewed at dusk, this home resonates a sense of elegance and sophistication. Although well-integrated with the natural landscape, the dwelling stands apart as a commanding and imposing residence. From this vantage it is difficult to see the magnitude of this house. The structure appears rather modest in its size, adding an element of intrigue to the design. White render is paired with glazed and timber accents. The crisp clean hue works beautifully to evoke a sense of modernity, while one of the most obvious architectural highlights is the curved balcony. This striking yet recessive feature juts out above the front door, and adds an outdoor relaxing space. Additionally, we are able to glance the vertical glazed panel to the right, which seamlessly contributes a huge volume of natural illumination within the abode. Taking a quick peek around the side of the home, we get a better idea of the size of the structure. Hidden from the front of the dwelling, the side amplifies the use of strong geometric lines and shapes. The interesting form is the result of the sloping landscape and the amazing interior that awaits you inside. From the side you are also able to take a peek into the interior of the home where the large glazing windows offer a connection between the exterior and interior. Ready? Let's take a look inside! Wow! When we first enter this dwelling the overwhelming impressiveness is palpable. The home is large, luxurious, and modern. One of the first instantly breathtaking features is the use of timber. 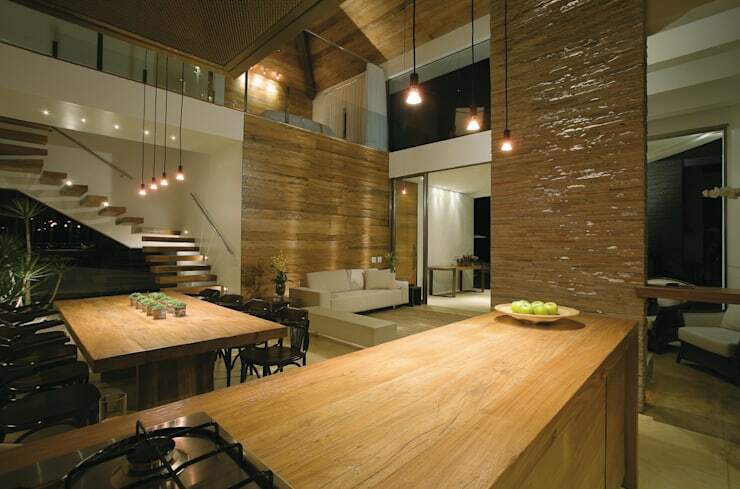 The wood ceiling and matching walls bring a little nature into the home, and add depth to the overall design. In the background of the image we see the front doors, with steps leading down into the living and dining space. Lighting is a spectacular feature, offering pendant bulbs that hang within the entirety of the double height space. 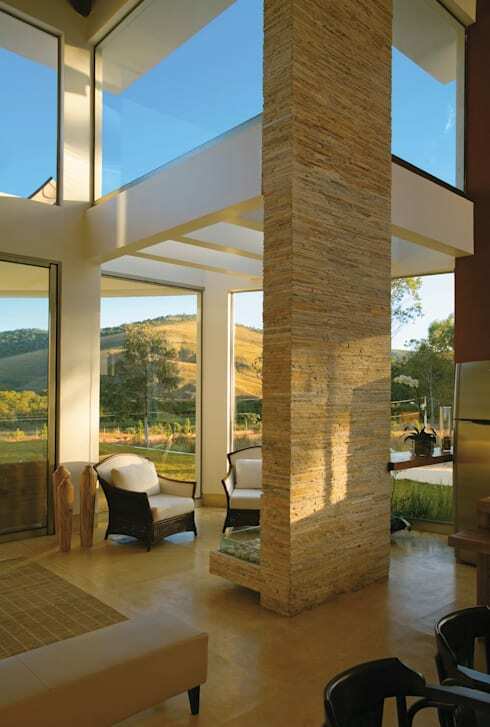 Additionally, the use of stone is an alluring choice, imparting a texture that works beautifully with the rustic timber, and sleek off-white interior. Changing our perspective, turning around, and taking a look at the loft bedroom, we are privy to a stunning panoramic view of the surrounding countryside. Light is plentiful, and the balcony offers the occupant a place to take in this glorious view from the comfort of a timber banana lounger. The sleeping quarters themselves are elegant and graceful. Making the most of the vaulted timber ceiling, there is also a privacy curtain to curtail prying eyes. The room is voluminous and airy, ensuring a bedroom rich in peaceful rest and relaxation. Back downstairs towards the rear of the home, the gorgeous double height space is seen once again. Glazing truly benefits this dwelling, imparting a cohesiveness with the exterior landscape. The house is contemporary in its design, and yet boasts rustic liveability. The furniture is a gorgeous blend of charismatic country style, with sleek modern finishes. 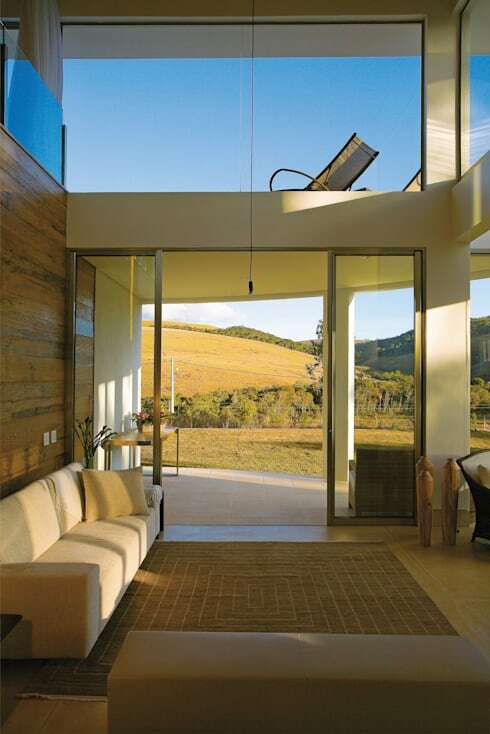 Essentially the space aims to break down the barriers between the natural environment and the interior living spaces. It does this with grace and refinement. Turning to the right, and we are able to glimpse another gorgeous sitting area. This captivating room features two armchairs, and is a luxurious location for a morning or afternoon cup of tea or coffee. The small alcove style space capitalises on its views, and utilises the abundant glazing to bring in natural illumination, and the images of a vibrant changing landscape. This is possibly our favourite space within the home as it manages to blend a sense of comfort and homeliness with intriguing textures, architectural features, and the breathtaking scenery beyond. Heading back downstairs and into the large kitchen, we are provided with sweeping views of the open plan lounge and dining area. 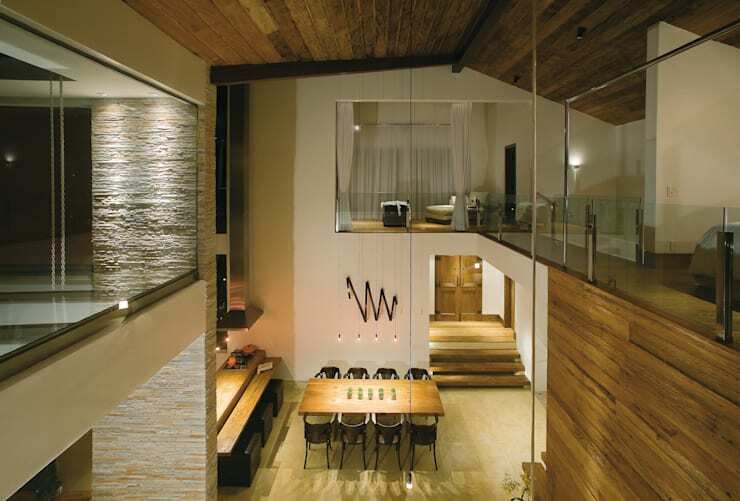 The textures employed within this dwelling are stylish and sophisticated. An earthiness is apparent throughout, with rich stone and brown hues adding to the overall design. The centre column has been clad with stone, and is an eye catching focal point for the room, while the kitchen utilises this to add bespoke timber joinery in the form of an island and breakfast bar. This house fits together perfectly. Almost tetris-like in its perfection, each modular element is sleek and well-integrated. The stairs are a lovely example of this, managing to work as an attention grabbing piece of furniture, without impeding on the other internal spaces. Lighting is subtle and evocative, romantic and restful; the perfect accompaniment to a polished and individual abode. For one final view of this house before the end of our tour, we take a look at the rear entertaining space. Almost magical in its appearance, the entire home exudes both refinement and grandeur. 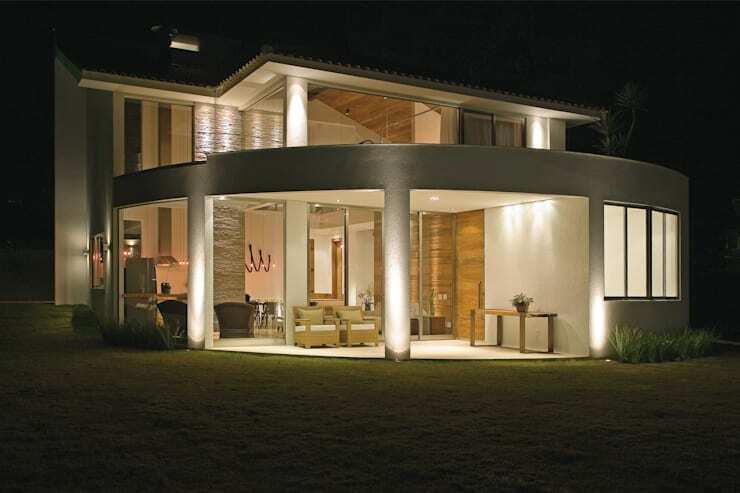 Magnificently lit with soft, well-placed lights, the home draws the viewer into its interior and semi-exterior spaces. The large curved structure works as a patio to provide year-round weather protection, excellent for entertaining or dining. The home is inventive in its approach, yet exhibits graceful restraint, often unseen in today's contemporary dwellings. What did you think of the extensive glazing and loft-style construction of this countryside home? We'd love to hear from you in the comments below!